The "Lions" - two magnificent peaks lording over the metropolis of Vancouver, BC. Although often climbed in summer - in Winter, these predators wait, year after year, for RISK takers. Dozens of backcountry skiers have died in the surrounding North Shore mountains - in terrain far less dangerous than the Lions own high lair. To date, extreme skiers have shied away from the taunt of conquering their snowy summits. Too RISKy! Too extreme! Yet, this Mar 30, a once in a Blue Moon attempt will be made by several of the world's top extreme skiers, to ski and tame these beasts. May they live to tell the tale of their hunt. 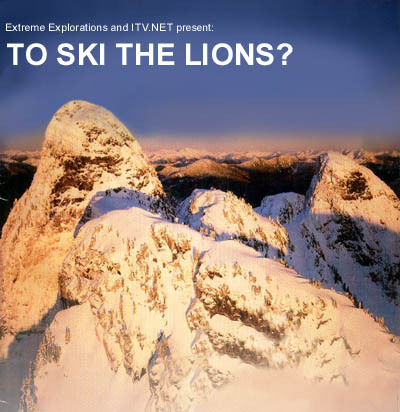 The Lions are two breadcone shaped peaks which have been tantalizingly looming over Vancouver's north shore, and it's avid extreme skiing community, for countless years. In the summer, they appear as sheer cliffs. These two "parallel french baguettes" have thus jeered many ski mountaineers but seldom has there been enough snow at these lower Coastal elevations to even think of skiing them. Well, this winter has been different. Remnants of last year's El Nino termed by some as "La Nina" have brought the North Shore Mountains of Vancouver a huge gift of the white stuff. If there is a time to ever ski the Lions it will be sometime in the next few weeks. We are setting the date for March 31st,1999, weather permitting for the climb and descent, or the first clear days after that. The objective is the West Lion but there may be a line off the East Lion as well.
" The Lions have never been so doable - West Lion could be skied from the top, down the west shoulder and then a 40-50 foot leap into the Col (maybe). It's slightly possible you could find a line straight down the face, from the top, but I doubt it. East Lion is skiable straight down its' face for the first 100-120 feet of vert and then about a 40 foot jump onto the top of the main face." ITVnet and Extreme Explorations will bring you some very unique video webcasts leading up to, and covering this first ever ski descent. Stay tuned to this site as some of the world's best extreme ski athletes prepare for this incredible feat. Co-produced by Union Arts. The multicamera and aerial footage will be spectacular, to say the least. The near vertical descent will be framed by gorgeous views of ever so beautiful Howe sound, and Vancouver, seemingly only a snowball's throw away . Last year, a group of skiers were just a little late as the spring thaw left gaping rock outcrops and made the descent impossible. In other years, some of the world's best "extreme" skiers had been spying the descent looking, and hoping, for when the time might be just right. Well folks that time has come !